Groundwater Sciences Corporation (GSC) was retained by a regional petroleum firm to characterize and remediate a former retail petroleum dispensing facility where an unleaded gasoline underground storage tank (UST) system and heating oil UST had leaked. The site was also impacted by separate-phase liquid from the adjacent upgradient facility. The one-acre site and surrounding properties are located in a mixed commercial/residential area. More than 70 soil characterization and attainment samples were collected and 13 soil monitoring wells were installed to delineate soil and groundwater impacts at the site. The soil impacts were extensive and the dissolved-phase groundwater plume extended onto the adjacent property. 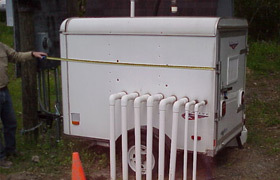 An air sparging / soil vapor extraction (AS/SVE) system consisting of nine AS/SVE points was installed and operated to remediate soil and groundwater in the area. Separate-phase product was detected in some of the wells, and was removed to the maximum extent practicable through vacuum truck treatments and periodic hand-bailing. Soil vapor sampling showed no issue related to soil vapor intrusion into on-site occupied buildings. The majority of the soil at the site was remediated to the Statewide Health Standard. The AS/SVE system was used to reduce concentrations such that there would be no post-remedial care obligations. The PaDEP ultimately granted Relief from Liability using the Site-Specific Standard for both soil and groundwater through pathway elimination. The cost of the remediation was significantly lower than the cost at similar sites that used the Statewide Health Standard approach.